Making the valentines, originally uploaded by Sabra Smith. 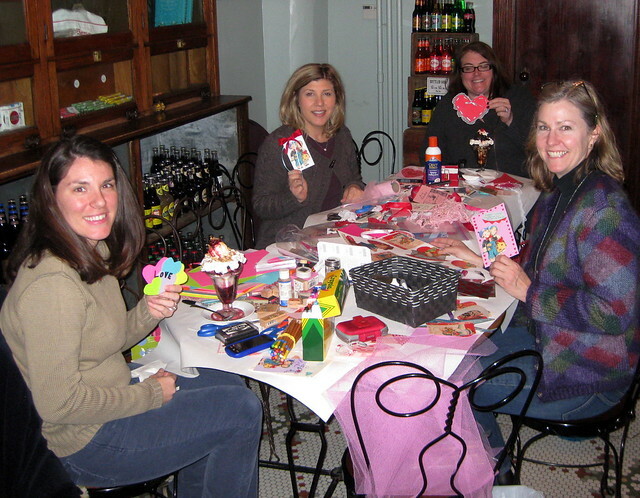 I picked Franklin Fountain and its wonderful vintage atmosphere (well, and the homemade ice cream, and the really nice people) as the location for a recent Etsy Philadelphia meet up as part of their Special Delivery: Share the Love “craftivism” project. 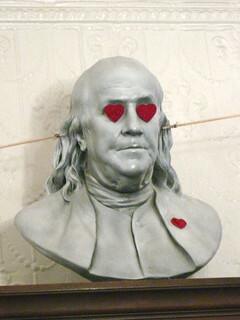 The valentines we made will be sent to Etsy HQ in Brooklyn. They are hoping to gather enough cards that Citymeals on Wheels can deliver one with each of the 18,000 meals they’ll deliver on Valentine’s Day. Final valentine count: 120 valentines of all shapes and sizes, made with doilies, ribbons, flowers, vintage images, new images, hearts, flowers, fish, rabbits, foil hearts, lace, 3-D effects, and more. For more photos of the evening, click here. ← Foto Friday: How much is that preservation in the window?